Prototype has triple the capacity of Tesla’s Superchargers. The ultra-fast prototype charger has capacity of 450 kilowatts, more than triple Tesla’s Superchargers. Test vehicles developed to take that much power were recharged to 80% capacity in 15 minutes. Tesla’s stations need about 30 minutes for a similar charge, according to its website. Carmakers, developing a wave of electric models to keep up with tightening carbon emissions regulation, are under pressure to overcome consumer turnoffs like slow charging times and patchy infrastructure. With demand remaining tepid, BMW, Daimler AG and Porsche parent Volkswagen AG are also building a fast-charging network along major highways in Europe. 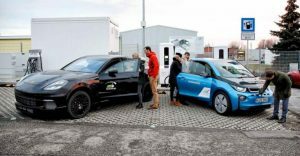 The super-powered charging point was developed by a consortium comprising the two German car brands, engineering giant Siemens AG and charging specialists Allego GmbH and Phoenix Contact E-Mobility GmbH, the station in Bavaria was opened to the public on Wednesday. It’s free to use for existing models, BMW said Thursday in a statement. One drawback — the charger offers more power than current models can take on. The BMW i3 limits its power intake to 50 kilowatts, while the battery-powered iX3 will triple that to 150 kilowatts when it rolls out in 2020. For the test vehicles to withstand the full electricity surge, Porsche used a cooling system that keeps battery cells at a steady temperature, while the charging cables were cooled too. Siemens provided a higher electric voltage energy supply to test the limits of the power jolt.